6 You Know You Want To. 7 Where Dreams And Imagination Come Together! 8 When Only The Best Will Do. 9 We're In Your Corner. 10 We Repair, What Your Husband Fixed. 11 We Can Fix It! 12 We Build For Beauty, We Build To Last. 14 The Sun Sets On The Old And Rises With The New. 15 The Professionals To Call In Home Improvement! 16 Quality Service Is First. 17 Phone E.T. for your home. 19 Improve Your Home. Improve Your Life. 20 Improve Your Home. Improve Your Life. 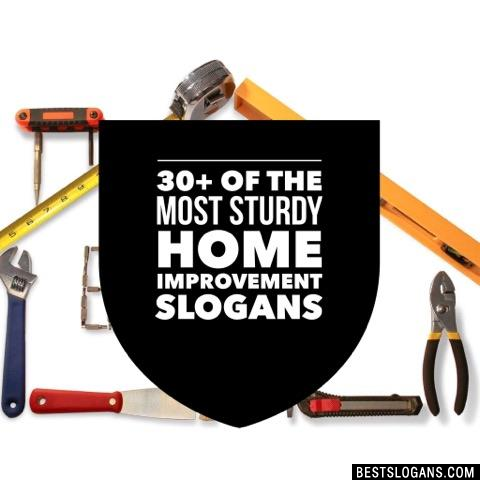 Can you think of a good Home Improvement Slogans we're missing? Or come up with a clever one of your own. Please share below.